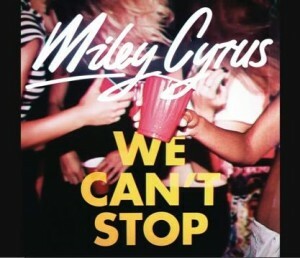 Miley Cyrus has revealed her highly anticipated new single today. “We Can’t Stop” was unveiled today on Ryan Seacrest’s radio show. The song is a mid-tempo song featuring Miley talking more than singing. I’m currently on my second listen and while the song is mildly catching and growing on me, it’s not as big and Summer-Anthemy as I was expecting. I get a vibe that this song would fit better as a second or even third single off her upcoming album.